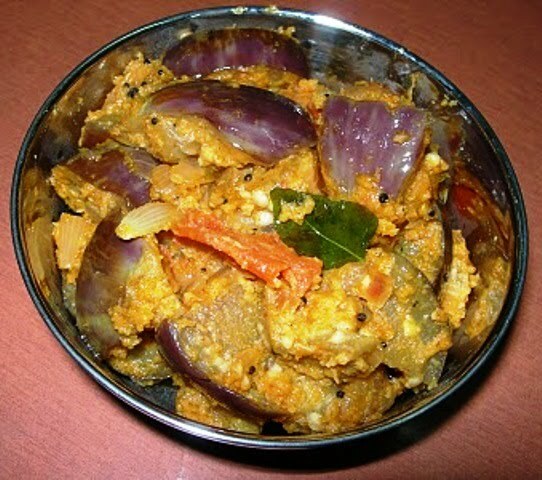 Cut the brinjals into medium size pieces and put it in water. Chop the onion and tomato finely. Dry roast peanut, til seeds and powder it coarsely and add coconut gratings and again grind coarsely. In a kadai put oil and when it is hot add mustard. When it pops up add chopped onion, curry leaves along with ginger garlic paste and fry till onion turns transparent. Add chopped tomatos and fry for a while. Add sambar powder, turmeric powder and salt. Mix well. Add brinjal pieces and sprinkle little water. Reduce the heat and cover with a lid. Cook until the brinjals are soft. Add coconut peanut powder and mix well. Remove from stove.